Routt County has a robust and diverse business community, with a wide range of resources to meet the needs of employers and employees. Steamboat Springs is the largest employment center in the county, with additional economic activity generated in the incorporated towns of Oak Creek, Hayden, and Yampa, and in the unincorporated areas of the county, where mining and agriculture are key sectors. Explore further to learn more about our communities, largest employers and industries and companies. Steamboat doesn’t have huge traffic jams or high crime rates. It’s a town where people feel comfortable striking up fun and friendly conversations with others. This is a place where a newcomer can still make a noticeable difference in the life of the community and a business can prosper with community support. For more information on living and working in Steamboat Springs, Colorado, visit movetosteamboat.com. 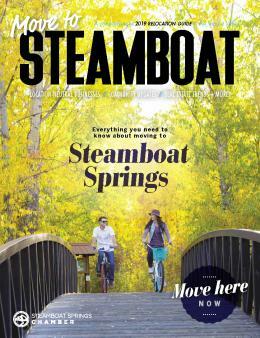 You can also request the Move to Steamboat relocation guide via mail or download on the Steamboat Springs Chamber website at the link below. A significant strategic advantage to working or owning a business in Steamboat Springs and other Routt County communities is that employers and employees find it easy to balance work and fun where recreational amenities are close and abundant. Steamboat Springs also has the services necessary to support a new or existing business including business support services, product shipping options, high-speed Internet, cellular services, affordable utilities compared to the rest of the nation, a regional airport nearby and space for commercial growth. Steamboat Springs is strategically located in the middle of the country and three and half hours from an international airport.